Commissioner Lou Marchello checks out his new Chromebook during the Nov. 21 Polson City Commission meeting. 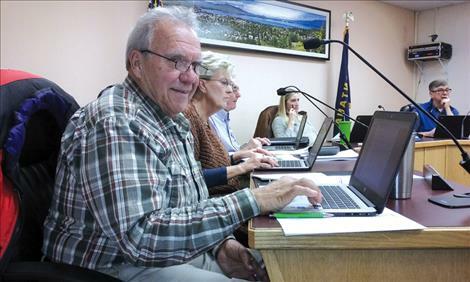 POLSON — In order to save time and money, the Polson City Commission will start using Chromebooks for their twice-monthly meetings. City Finance Officer Cindy Dooley made the announcement at the Nov. 21 commission meeting. She passed out Chromebooks to commissioners and gave them a brief training session. The commissioners will each pick up a Chromebook on Thursdays at town hall prior to their bi-monthly meeting. Dooley said the city was looking for ways to save time and cut down on costs. She added that the Chromebooks will be helpful when there are maps in the agenda packet. The commissioners will return the Chromebooks at the end of each commissioners’ meeting. City Manager Mark Shrives said the city considered purchasing conventional laptops along with tablets. However, he explained that Chromebooks are less costly than Apple computers, for example, and have larger screens than tablets. The HP Chromebooks cost the city $279 each for a total of $1,953 for seven. “This is too high tech for Polson,” commissioner Lou Marchello joked after the training session.